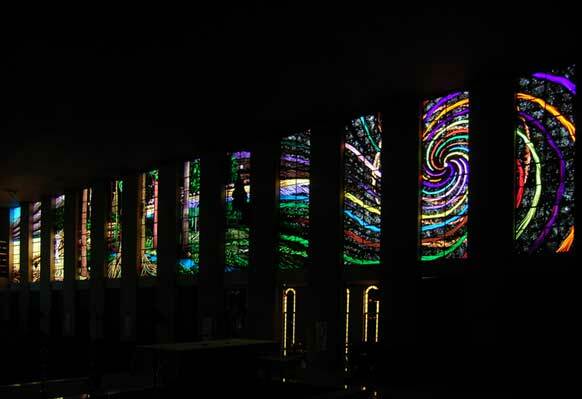 St. Monica's Cathedral in Cairns houses the largest modern commission of stained glass in Australia. 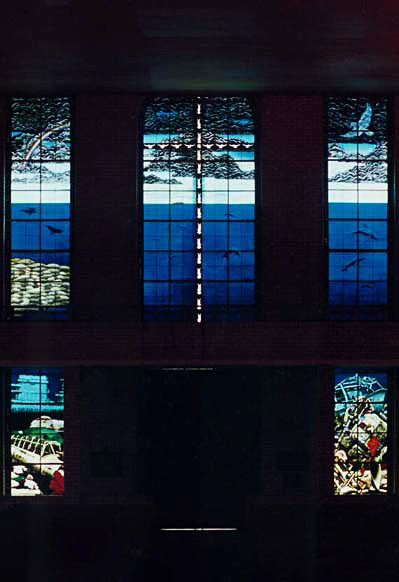 Gerry Cummins and Jill Stehn completed the “Peace” Window before being commissioned to make the twenty-four “Creation” Windows. 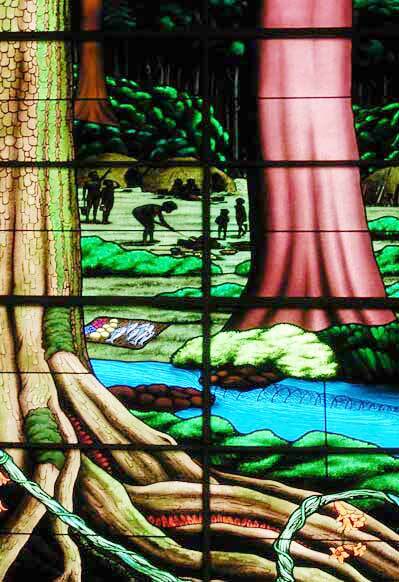 The "Peace" window took a year to build, followed by four more years to complete the "Creation" windows. 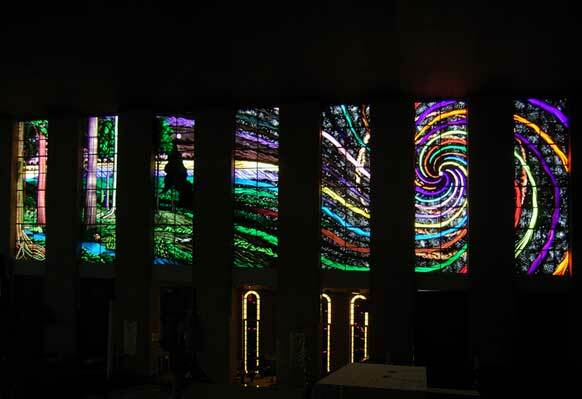 The “Peace” window occupies 80 square metres of glass in the Cathedral, and the “Creation” windows 240 square metres. 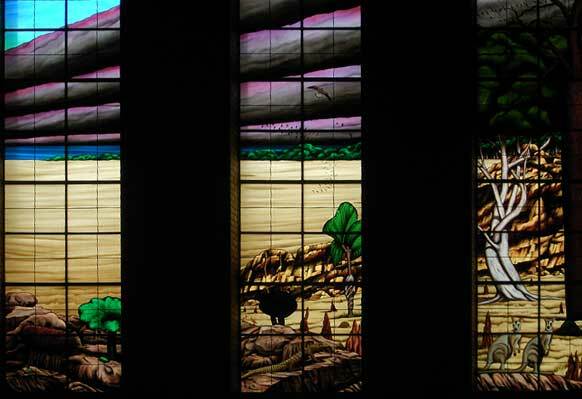 Collectively, these windows occupy all of the glass in the nave of the Cathedral. 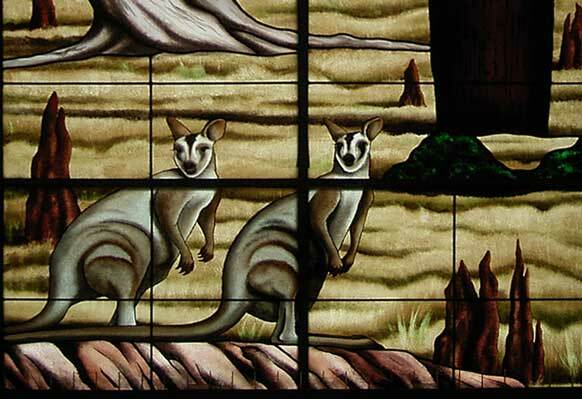 This commission was the largest hand-painted kiln-fired stained glass project ever undertaken in Australia. 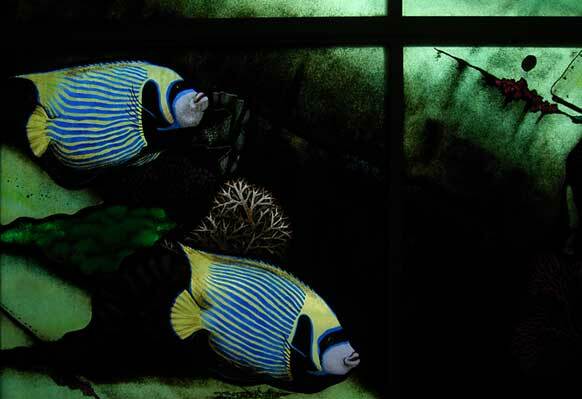 The windows have been nationally and internationally acclaimed. 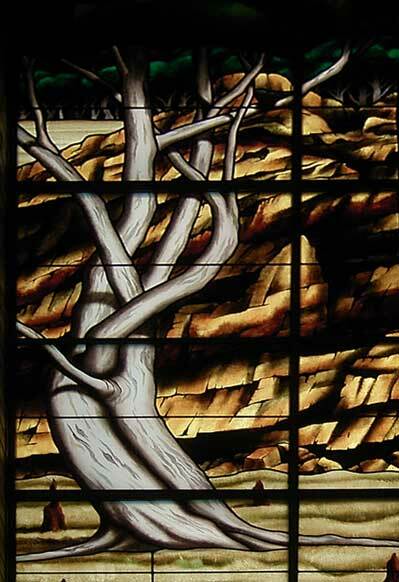 View from chancel where “Creation” windows 1 – 12 meet the pre-existing “Peace” window which forms the front east facing door surround, then flow on to “Creation” windows 13 – 24. 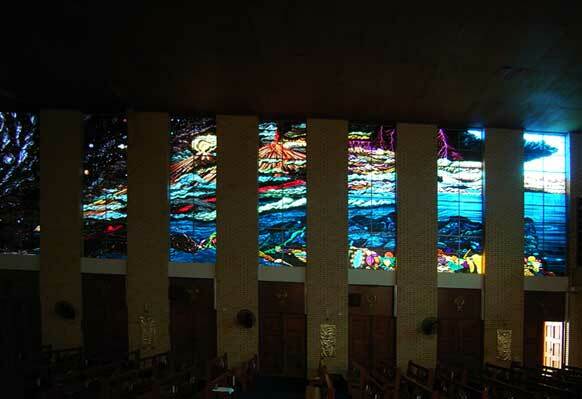 There is also a detailed description of all the windows on the St. Monica's Cathedral website. This includes an audio commentry. 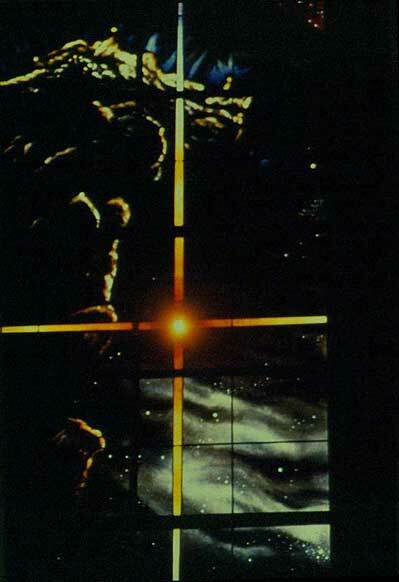 The “Peace” window is the front door surround of St. Monica's Cathedral in Cairns. 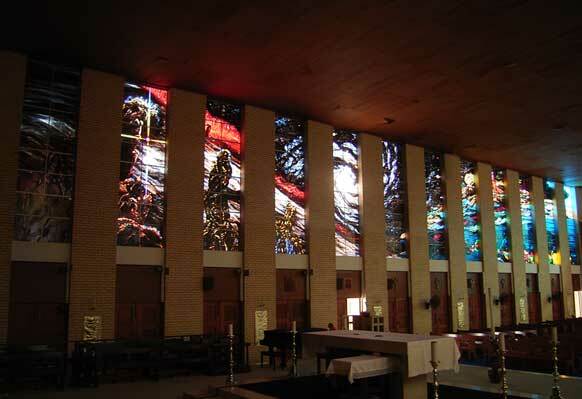 It comprises three windows, being two flanking panels each 1.7 metres x 11 metres, and a central overhead panel of 3.5 metres x 7 metres. 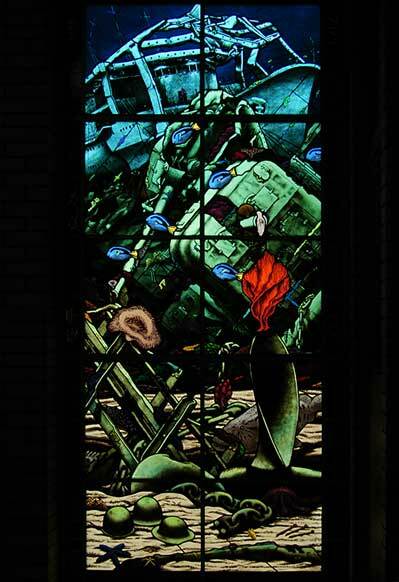 This window was commissioned to commemorate fifty years of peace in the Pacific region since the end of World War Two. 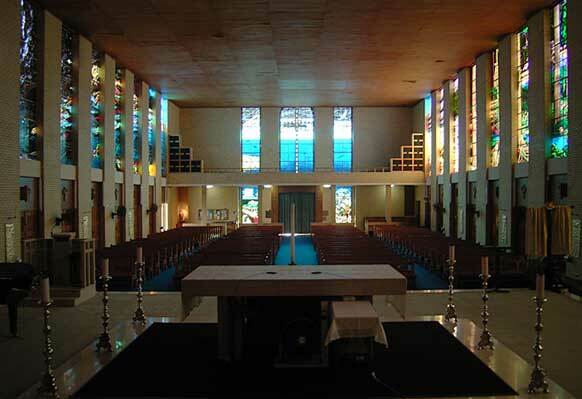 The Cathedral is dedicated to the Battle of the Coral Sea, fought due east of Cairns between the 4th and 8th of May in 1942, and the significance of that battle to all Australians provided Gerry and Jill with the unique opportunity to create a truly relevant set of contemporary Australian windows about peace. Cairns was expecting to be invaded and many women and children had already been evacuated south. 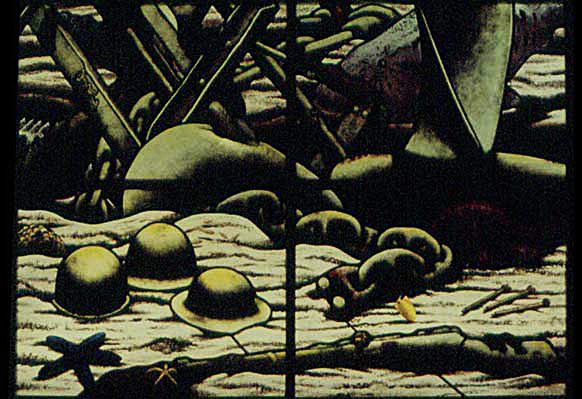 Townsville had been bombed by Japanese aircraft and Sydney Harbour attacked by Japanese midget submarines. 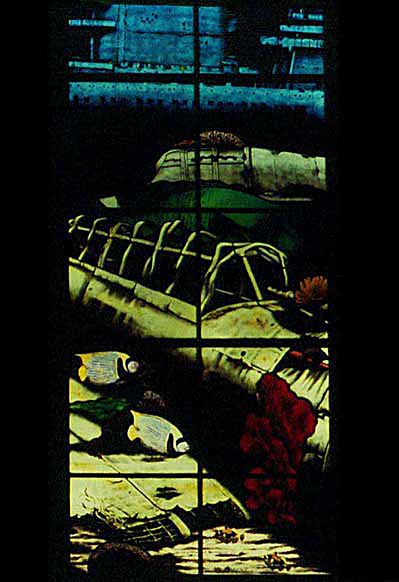 The Coral Sea east of Cairns was the southern-most point to which the Japanese surface navy advanced during World War Two. 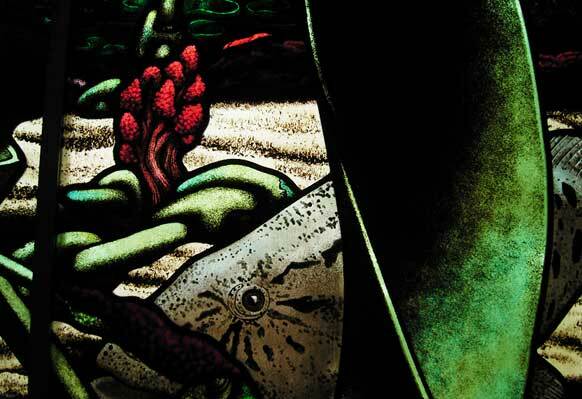 The windows abound in symbolism, with images of tangled wrecks, weapons and other military equipment, rusting and decaying at the bottom of the sea, now peacefully housing thriving colonies of coral and other marine life. Nature’s grandeur is replacing man's belligerence. 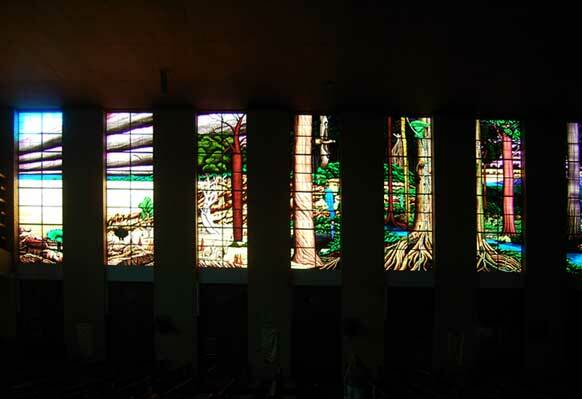 The Peace Window viewed from inside the Cathedral. 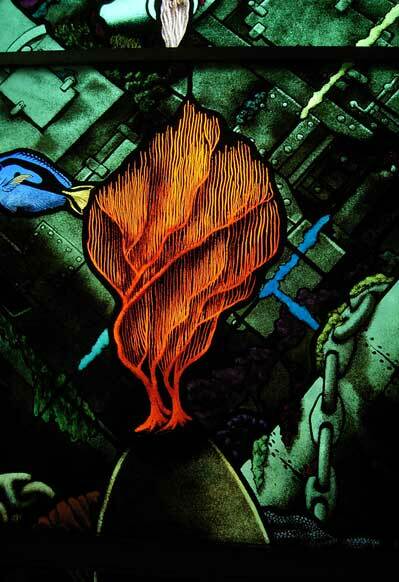 The following images are details from the Peace Window. 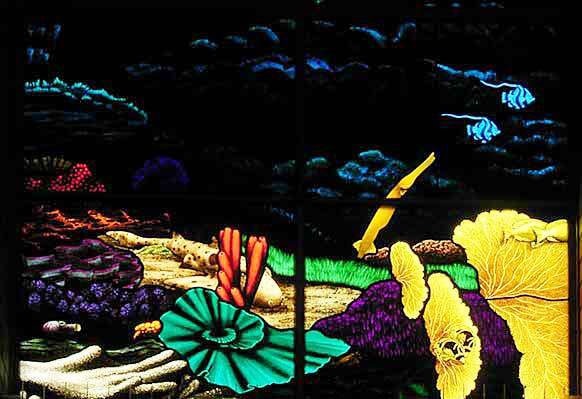 There are three crystals strategically placed in the windows progressively symbolising Light, Life and Love. 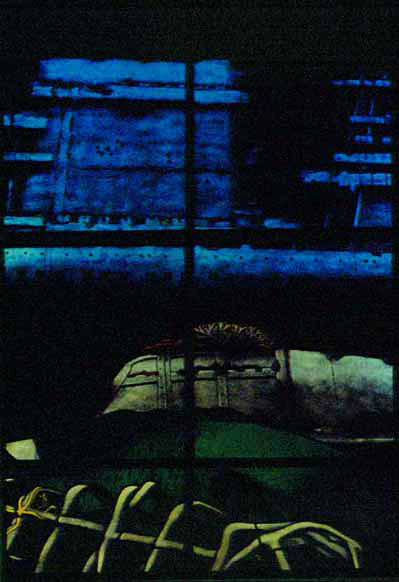 View of windows taken from the chancel looking at “Creation” windows 1 – 12 on the north side of the Cathedral. 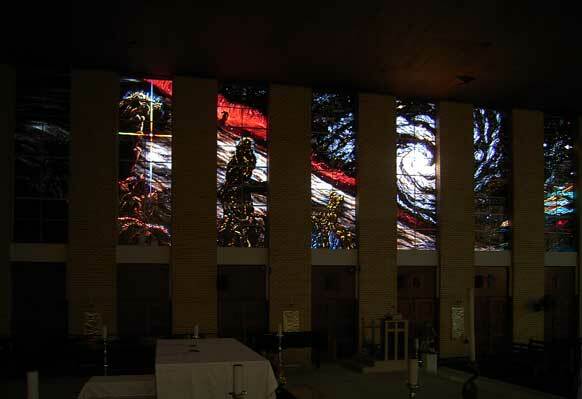 View from chancel showing “Creation” windows 13 – 24 on the south side of the Cathedral. 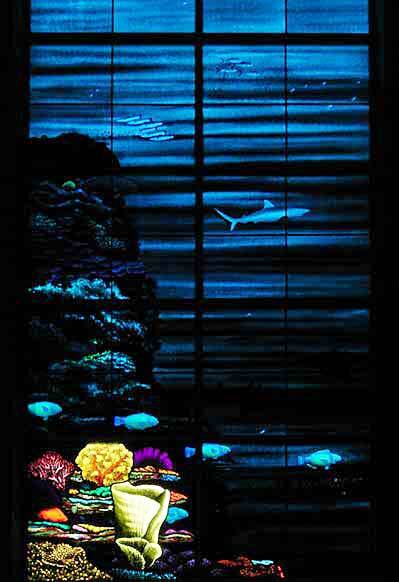 Windows 1 – 7 – from the Void through deep space to the formation of the planets. 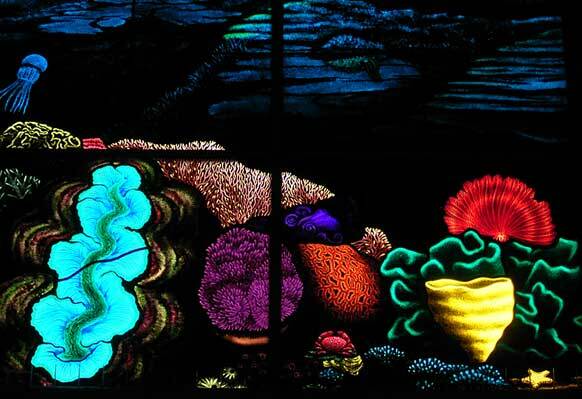 Windows 6 – 12 depicting the formation of the sky, the earth and the sea and Life and the Great Barrier Reef. 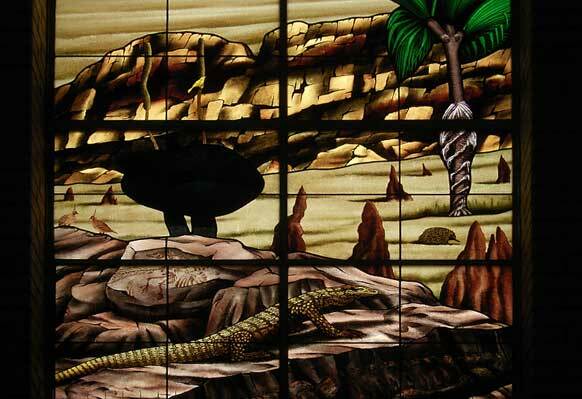 Windows 13 – 18 depicting the Cairns Diocese from west to east, starting with the Grasslands, moving through dry sclerophyll forest into the rainforest, with accompanying flora and fauna. Windows 18 – 24. 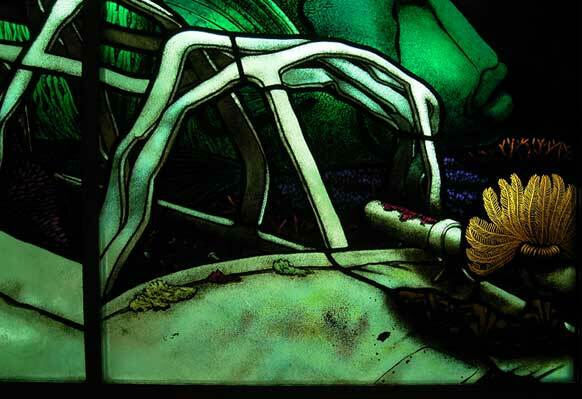 Window 18 depicts the Creation of Man and moves through to the melting away of the physical into the metaphysical, concluding in a spiral which reciprocates the Milky Way in windows 1 – 6. 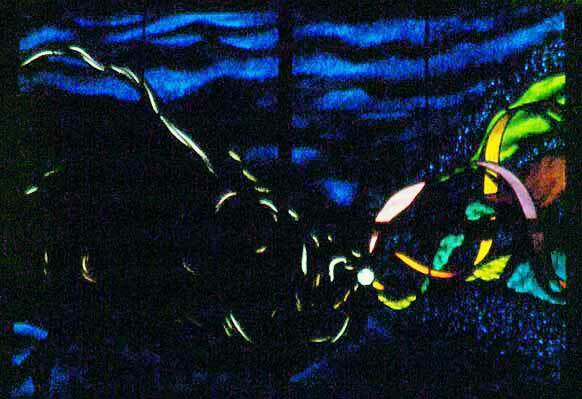 The following images are details from the Creation Windows.